It's time for another instalment (is that even right?) of Beer of the night. Heineken is one of the world's most popular beers, I've been drinking Heineken for a year and a few months now, the FIRST time I ever had the beer was on New Years Eve '03.. didn't really care for it then. The beer comes in either cans or green bottles. I prefer bottles, out here in Manitoba Canada, you can get bottles of Heineken in regular 341ml size (green bottles) or 710ml "big boy" bottles. I prefer the 710ml bottles since they are cheaper in the end, $3.03 for a 710ml bottle, instead of $1.79 for a 341ml bottle. It also comes in cases of 12, which are sold for $20 or so, but it's a bit excessive for me, I'dd rather get the big boy bottles. The taste depends on your mood and how you drink it (in my opinion), if it's nice and cold and you need a good beer to relax to, it has a nice taste from it, I prefer it in a beer glass, it just tastes better than out of the bottle, although there have been times when the beer was room temperature and the beer tasted pretty nasty. 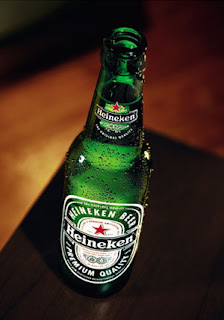 If I had to choose between only having one bottle of Heineken for the rest of my life or drinking as much American beer as I can, I'dd choose the 1 bottle of Heineken, it just tastes better.. and it's actually BEER!